How sweet it is for the elites on top with their greedy fingers on the lifeline! How did we ever allow this cartel of 24 ABMS organizations and their "Chicago umbrella" to put their unscrupulous thumbs on our navel pressing hard. And why do we allowing them to keep pressing their thumbs into our most sensitive places. Why did we allow self-enriching/self-perpetuating money/political schemes to evolve into what they are today? Look at the ABIM. It is the largest of them all and serves the "Chicago umbrella". At first the ABIM/ABMS during the 1930's served straight coffee virtually for free. A few board members and a couple officers served/volunteered for free. They were sharing the privilege of being a doctor and offering the pride of lifetime certification. The ABIM's first test in 1936, for example, had 8 essay questions to be answered by diplomates. All 27 candidates passed with a 100% pass rate. Look at today! What was it like in the good old days of honor and collegiality comprised of a responsive board in relation to the young candidates and experienced diplomate? "Nobody hustled nobody for money." A few doctors banded together who had a voluntary certification in mind to separate "men of science" who went to a medical school versus "street vendors of tonics and snake charmers". The mission to certify physicians was pragmatic during chaotic times of the depression to help with creating esteem that translated into enhancing their practice and bottom line. The mission was accomplished after only a few decades. By the time post-war America rolled around there were still not that many physicians interested in certifying. It simply was not that important for the majority of physicians. And it was not required at all. Medical school training and residencies/fellowships/diplomas/CME licensing requirements were status enough for most docs. Furthermore, many certifying physicians who served on the ABMS boards, changed overt time in psychological attitude. They began to see themselves as members of an elite society and not just a certified physician who took a difficult test. And looking at the history of certification, patients never had much knowledge of ABMS certification or that it even mattered. Thomas Brem (ABIM Chair 1965) during the 1950's and 60's considered himself to be a member of a elite club if you look at what he said and did. He sold out patients for money. That is what the public record clearly shows. Brem testified on behalf of BIG Tobacco providing unscientific recommendations in favor of Wall Street profits and not Main Street's health needs. Cancer was linked to cigarette smoking. Brem through the cunning use of manipulated graphs tried to convince Congress that lung cancer rates were not necessarily connected to tobacco use, even though the Surgeon General came out with warnings in 1964 five years before Brem's "testimony". What the heck happened to us after that! First, the coffee got watered down. Why? The executive positions were invented and they started to self-inure themselves with the savings on watering down their ground up beans. The ABIM's stupid unnecessary lawsuit against ABR (Dr. Arora) proved that the tests were watered down rehashed old questions. The ABIM was not keeping up and claimed that science was too expensive to get our a viable test every year. So they cheated and added water to their dark pool of certification test questions. And they failed a lot of docs in order to pad the revenue stream. They even went after other competing board prep companies to bolster their partner ACP's MKSAP board prep materials. And they had to pay big money to lawyers to protect the fact that they watered down the rehashed grounds. And the utilized secret dirty tricks police and tainted attorneys to spy on and persecute YOU! What is MOCA? A coffee beverage flavored with milk, sugar, and cocoa. Let's break it down: coffee was the initial cash generating crop for the rich merchants and elites, just like certification was the initial cash generator for the professional medical bureaucrats at the ABMS after their ethics headed south. MOC (MOCA) was added as an additional cash cow when the initial certifications were in decline as executive expenses were going up. Self-enriching quality assurance bureaucrats were drinking most of the ABMS brew's revenues. Adding the cash cow (milk, cream) was good for obfuscating the negligent financial stewardship as well. I always chuckle when I see the well-reasoned arguments presented in opposition to MOC falling on ABMS executive's deaf ears. What could we expect they've got their auditory canals stuffed with cash. The ear drums are plated gold with their ever-increasing demand for cash and physicians' time. It amounts to half a billion dollars all those nickels and dimes. And the wasted MOC/MOCA minutes really equate to a lifetime being under the thumbs supporting the ABMS' crimes. Well reasoned arguments are not for self-enriching politically zealous executives with the tin ears. It is like the seed falling by the wayside that gets devoured by birds and trammeled under the feet of callous thieves. Instead take your arguments and documents to the legislature to end mandatory MOC and to the prosecutor to get your money back. The ABIM is outrageously evil. In Dr. Salas Rushford's fight against the ABIM's financial and political persecution of him (and all physicians) we see more blocking of evidence and stonewalling by ABIM's attorneys. This time they are blocking evidence from Westby Fisher, MD. Go to pacer.gov, log in or create free account, search for American Board of Internal Medicine cases. NJ 2014 open case. 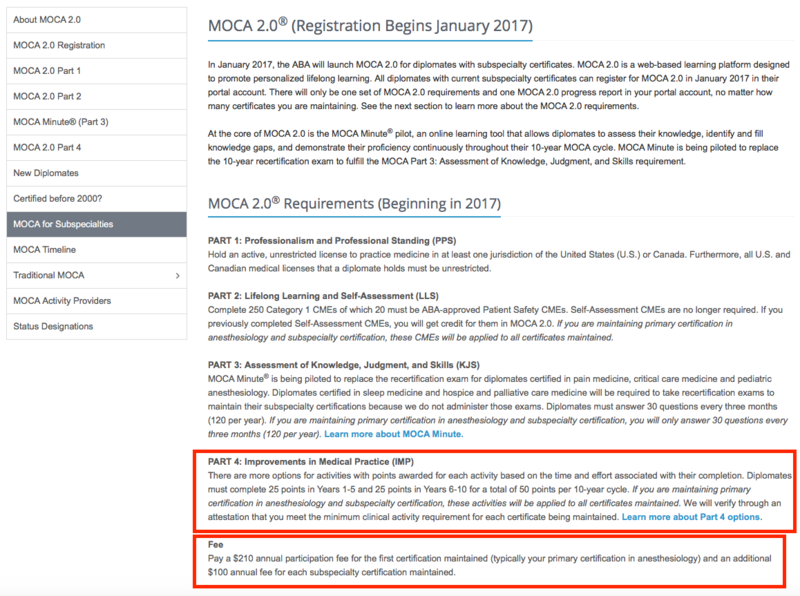 I paid the $2100 to take the MOCA exam. It was 200 computerized questions that took me 90 minutes to complete. I had to drive 5 hours round trip, but the test itself cost more than $20 a minute. I passed, which was supposed to be good for ten years. Instead, within a couple months, I was notified that the test was made non-mandatory for my cohort, and I would also be enrolled in MOCA 2.0 (and not grandfathered in / exempt). 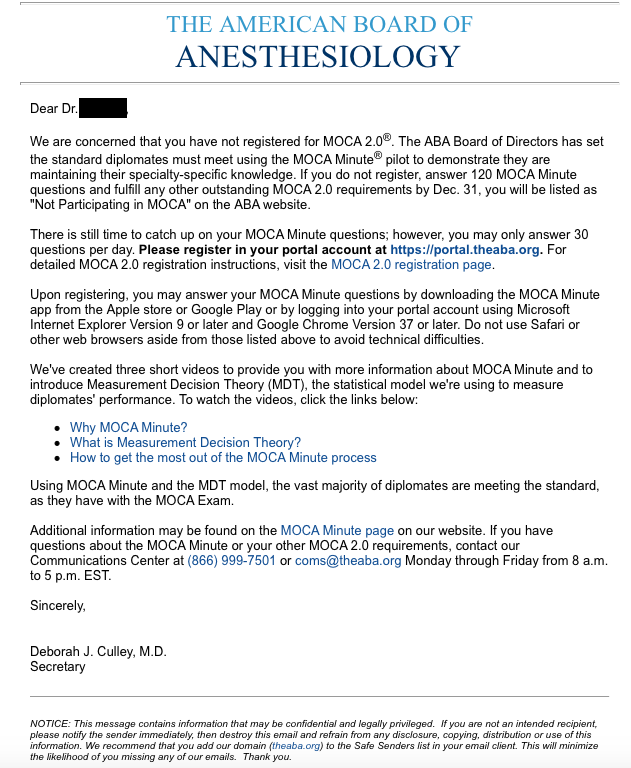 After some angry calls and letters, the ABA decided not to charge us for ten years if we pre-paid the $2100 and took the test, but we still get the privilege of being held to the MOCA 2.0 requirements, despite having fully complied with MOCA 1.0. And they wonder why we're disillusioned. Will the ABIM/ABMS with all of their infinite political and financial connections put Dr. Wes to on the FAKE NEWS LIST? Will Wes Fisher be the next to be blocked by Google from blogging? Google and Facebook are on the witch-hunt to chill 1st amendment rights. Will one of Google's "advisory boards" with medical politicians like Bob Wachter as an advisor in the past pull the plug on DR. WES? The political origin of fake news sites. What an abusive waste of time! Did you get a copy of the pledge/contract that opened you up to legal liability--both civil and criminal--if you are deemed to have engaged in any irregular behavior. ABMS is so cunning they will read your complaint and then modify their testing to include/offer a $2100 test taken in your home/office where a third party proctor takes control of you and your computer checking for any irregular key strokes, eye movement, too many bathroom breaks, unusual blogging after the test, and on and on. They don't just want your money, they want to put you out of practice, in court or in jail. ABA Offshore/Cayman Investments? ABA and ABIM have the same auditors according to latest filings available. Maybe they have the same investment philosophy also--high appetite for risk? It appears so. ABA most recent 990 tax filing from 2013 shows a healthy investment portfolio. There was a sharp increase in value from 2012. Investment income doubled from around 1 million to 2 million dollars. Some of these investments show that some portion of their investments was shifted to a different category of allocation/designation. It is not specific enough, but on part VII schedule D the mix is much more specific. Generally alternative investments are not more than 10% in an endowment or non-profit with conservative investment philosophy. ABA has larger portions in commodities, real estate and alternative investments funds. Roughly 50% in government and corporate fixed income and 50% in alternative investments. Hedge funds are the only way once could characterize "alternative funds" as commodities and real estate could also fall into this category. ABIM and ABA both have their tax filing and audits done by McGladrey. According to your last blog posting it appears that there has been a rebranding to RSM. The ties between RSM and Wolters Kluwer (parent of UpToDate) were mentioned already. And they ABIM and ABA have a very similar philosophy of taking on high risk investments and same damnable practice of bullying surplus revenues out of their clients to pay their executives. At least a few of them claim to work 50 hours and the compensation has not yet reached the million dollar club as Baron and Nora sock away for a rainy political day. Money is name of the game not quality assurance. The ABA has been steadily growing assets from $17.7 million in 2011, to $21.4 million in 2012 to 25.4 million in 2013. Sales of assets doubled and then tripled during the same time period, which would indicate a progressively aggressive investment practice. Some analysts might interpret this growth in revenue/income and high rate in turnover of assets as "explosive" for a quality assurance medical board. I would be interested in seeing the 2014 and 2015 990's if they are available. Why is there no link to the financial data on their website! How transparent is an organization that when you look at their financials it is like looking into deep space three light years ago. If they are anything like the ABIM they could have had a Foundation with even more money/risky investment assets hidden away. The ABMS tries to keep its skeletons in the closet and they like to be the only ones to hold the skeleton key. We can only analyze gender equality (male/female ratios) at the American Board Of Anesthesiology, because like most ABMS boards, diversity is practically non-existent. Looking at the ABA Board of Directors (a bakers dozen) we have 10 men and 3 women! That would be 10 Adams and three Eves. Something must have gone wrong in creation you might think, but no it is all just according to God's plan at the ABA. The higher position jobs should go to men. But not to worry when you get into the staff/service related jobs the statistics are reversed. Creation of men and women is beginning to balance out. Executive Team: you have three women and two men. That's a 3/2 ratio of Eves over Adams. Executive Administration: is comprised of 100% women. 2 female souls to administer over things for the executives team. Assessment Service Team: From here in the universal hierarchy it would appear that God ran out of men. 100% women. 5 female souls. Examination Administration: 100% women. 2 female souls. Examination Development: 86% female. 6 Eves and 1 Adam. Maintenance of Certification. 100% Eves. Two wonderful female souls. Psychometrics and Research. 100% women. 6 awesome female souls. Finance & Administrative Services Team: but wait God did not forget the men! God showed his hand. He only trusted men with the money. God said let 4 men control the purse and do the finances. God said, "Let only Adams have dominion over the Accounting, Administration & Records. And God said, "It was good." Meeting Planning: But then God said "Meeting and Planning" Department should go to two Eves - 100% female. God was also getting low in his funds since he just hired four men to the treasury. Information Services Team: Then God scratched his head thoughtfully and pulled on his beard a little. "OK," he thought, "I must dig deep into my purse for this domain." He chose 6 Adams to be in charge of infrastructure, but then at the last minute he tossed in a female engineer. That's 6 Adams and 1 Eve entrusted with the information and data flow. And God said, "It was good for data to be in the hands of men." Software Development: God said let there be men in charge of this since they are dominating the field. He chose 4 clever Adams and tossed in one talented Eve. A ratio of 4/1. Analysis & Quality: God was running out of money big time, so he gave 6 women and one man dominion over this field. And God said the female to male ratio was good. A ratio of 6/1. Marketing & Communications Team: God had mostly women left to hire, waiting in the universal lobby, so he gave this department to 5 Eves and 1 Adam just to keep an eye on things for him. And God said a ratio of 5/1 Eves over Adams was good. In the whole universal scheme of the ABA's staffing it is a ratio favoring Eves 42/18. God had hired 42 Eves and 18 Adams. But at the executive level, God in all His crest-jeweled wisdom, saw a 10/3 ratio as more fitting in with His sparkling plan. God hired 10 Adams to share the power with 3 Eves. Comment: when we look at how many IMG's, African Americans, Hispanic Americans, Asian Americans, Native Americans, etc, that there are in the U.S., the ABMS/ABA divine plan smacks of inequality and gender discrimination. We know the ABIM/ABMS cheats and lies. But do law firms and politicians cheat? Yes, they do and they do it all the time! Politicians and law firms busted on illegal contributions. Does the American Society of Anesthesiologists lobby? According to their 2013 990 tax filings they do not answer yes or no. But according to open Secrets the ASA does lobby and they have a relation with professional agencies lobbying on behalf of their clients. What does this mean? Does the American Society of Anesthesiologists ASA lobby on behalf of the American Board of Anesthesiologists(ABA)? One thing we see that is invariable about the medical boards and societies on the question of lobbying: they lie about it on their 990's or leave it blank unanswered even though they are engaged in lobbying. So whether the answer is yes, no, or left blank there is lobbying activity. This rather sobering and the IRS should crack down on this. The ASA had nearly $45 million in revenues in 2013, which is almost double the revenue of the ABA. Wes, has anyone really thoroughly investigated the relationship of the ABMS medical boards, the symbiotic financial relationships with each other and the ABMS umbrella, and their corresponding medical societies? There is a big story here. Who is covering it in the MSM? Open Secrets reveals $660k for the ASA lobbying activities. 2013 990 filing for ASA. Tack on all the mischief and cost of the ABA employees, directors and officers and it would be great idea to close the MOCA program down. It's about the money! It is blatant corruption. Any group of volunteer anesthesiologist could put together a quality certification test. Ongoing CME should suffice. The ABMS is a total money scam when it comes to MOC and MOCA. Regarding the certifications at the ABMS it would be better to have volunteers create a test for life that is totally voluntary again. When one looks at the American Board of Anesthesiologists and the American Society of Anesthesiologists it is quite difficult to see anything other than a money grab. After 2000, the ABA required 10-year certification for money then changed to annual collections recently in response to the great MOC rebellion. Pay the ABA $210 plus an additional sum for additional certificates if you want to keep working in your profession. What a scam! How can 10-year testing suddenly be replaced with the MOCA minute mandate? Now these mad men and women of the ABMS proffer up a totally new untested formula/experiment invented by their long lineage of "Self-Dealing Medical Politicians". Thes SDMP's ("self-dealing medical politicians") are creating endless bogus "quality assurance" in the name of "PROFIT" and "MONEY"! Now they are offering the caged MOC DOC a yearly collection of the same sum of "pay-to-play funny money"! How obscenely ridiculous is that! How can their mad-cap reverse in thinking blot away decades of science that told us we desperately needed a ten-year recertification because the public demanded it. Now just as haphazardly according to their "chaos theory of quality assurance" they offer us a coffee-drip torture called the "MOCA MINUTE"? How can I take any of this serious when everything I see being required is about MONEY? What is America becoming? One big junk-heap of endless Ponzi schemes. Doesn't anybody want to do something useful in their lives anymore? I have a burning question in all this. What is a non-profit organization really and how can I recognize one when I see one. Certainly the ASA and ABA are corporations involved in raking in tons of money. They work off of each other. They even share the same board members if one takes the time to look at the tax filings. That's about all we can see for miles and miles; we see an imposition of their bureaucratic red tape. The bureaucratic red tape/clicking is a vast dollar harvest scheme with the ABMS and a hundred other money grubbing political action committees of the same ilk with all the power and money. How can this yucky MOC MOCA crap be considered scientific proof of anything? MOC MONEY MANIA is an unpalatable insult to any intelligent mind. As a result of a conniving mentality, physicians have become slaves in America. We founded this nation to limit the influence of governments over the people. Now we have millions of little governments making our lives miserable. It's just like living life in the MATRIX. It shows how nuts these ABMS bureaucrats and medical society entrepreneurs are. They "offer" Americans a schizoid approach to quality assurance with money as the focus of their "medical science". The big problem with that is physicians and the public are waking up and the anger is growing. Dr. Rebecca Johnson is seen in this ABMS exclusive video about their trademarked Certlink pilot simulator. ABMS is testing the limits of medical knowledge and physician gullibility. Dr. Lois Nora was behind the green screen in the distant shadows walking away in haste with a golden parachute in her multi-million dollar suitcase. She was overheard saying quietly to herself. "Thank you ABMS MOC!" I just looked at the American Board of Anesthesiology's tax filings for 2011, 2012 and 2013 for myself online. How did ABA's investment in "alternative funds" jump from $1 million+ to $8 million+ in just two filing cycles. Who advised them on their investing practice? I see that each of the 13 board members is required to read and sign-off on their 990 tax document each year. Also of note: ABA's investment broker/custodian of record for their "alternative funds" is not indicated. Why not? Is ABA's rapidly growing portfolio of bonds, commodities, real estate, and alternative funds registered in the US or offshore? 2014 filings shows a jump in executive compensation of around 1 million dollars. Investments and cash holdings increased by roughly 1.5 million. There was a large influx into publicly traded investments of 13.6 million and a decrease in "other investments" by 13.1 million. The difference appears to have gone into a cash position. That is perhaps the magic and mystery of accounting when you wish to give yourself a pay raise. The "alternative investment funds" amounts remained slightly up to flat, strangely. It would appear commodities and real estate holdings were traded, but the degree of transparency in reporting does not allow any certain assessment. Maybe some window dressing or just moving from bonds to more equities. We assume that McGladrey received the detailed brokerage accounts documents with dividends purchases and sales. Incidentally, the 2014 report shows a loss of investment income by nearly half over 2013. One of ABA's largest contractor was Pearson at around 1 million dollars. The address for Pearson was on "Collections Drive". HA! That is the address for the entire ABMS! - COLLECTIONS DRIVE, CHICAGO, ILLINOIS. ABMS was a large listed contractor for ABA also giving them nearly 400,000. What is that much money going to really? There were contractors over 100,000 that were not listed - at least a dozen. Will ABIM ever hire anyone who is not a Clintonian health reform crony such as Cassel, Langdon, Biemiller, and Baron. Only non-partisan hires: felonious patsy crooks and those who cook and audit the books. - according to ABIM court documents too sensitive to make public. ABIM and its foundation is not just a monopolistic corporation involved in restraint of trade, it's is a state actor comprised of and conceived by state actors. "The Supreme Court has held private citizens to be liable as state actors when they conspire with government officials to deprive people of their rights." Is Christine Cassel a state actor due to her PCAST national security position (2009-present) advising the POTUS and VPOTUS on science and healthcare?. Was Cassel a state actor working inside (and outside) of the Clinton administration during the 1990's? Was the ABIM Foundation established in 1999 by Christine Cassel to serve the political and financial ambitions and agendas of Clintonian government healthcare reformers? Is the ABIM Foundation a state actor? Does ABIM's Choosing Wisely launched by Christine Cassel function as a designed component of the Affordable Care Act? Is the ABIM a state actor. Is the ABIM a political/policing arm of the ABMS? Is the ABMS a state actor serving to regulate physicians and healthcare with MOC and Choosing Wisely, which ABMS helped propagate and promote? Is MOC a part of the Affordable Care Act. If yes, are exponents and enforcers of MOC state actors? Did the ABMS lobby/conspire with state actors for MOC to be included in the ACA? 5. If government agencies are simply members of a private organization, the actions of the organization are not state action, but if the government is "pervasively entwined" with the leadership of the private organization, the acts of the organization are state action (Brentwood Academy v. Tennessee Secondary School Athletic Association, 535 U.S. 971 (2002))." Is the ABMS and ABIM State Actors? This has not yet been tested as far as we know. Did Judge Joyner err in his dismissal of Von Muller's claim that the ABIM violated her 14th amendment rights? The Supreme court has ruled that an organization which fills a "public function" which is ordinarily a state function, then one would have to argue adamantly against Judge Joyner dismissal of Von Muller's 14th amendment rights when he opined that the ABIM is not a State Actor. Christine Cassel as a state actor engaged in gross misconduct as ABIM and ABIMF's CEO/President and as head of the NQF. Cassel is and was under government contract as national security science advisor to the president of the United States early 2009 to present. Cassel falls under conflicts of interest rules governing high ranking government officials/public servants. Cassel served on the boards of Premier, Inc. and Kaiser Permanente key foundation. Cassel's unreported conflicts of interests, influence pedaling, graft, and cover-up. Premier, Inc. shares beat the healthcare market with government contracts and ACA related acquisitions. Premier was well positioned with the "egregiously conflicted" Christine Cassel "advising" and "calling the shots" in Washington. Cecity acquisition, CMS contracts, Obama Care value-based payments and other ACA drivers helped Premier "beat the market"
"Based on these results and our current outlook for the remainder of the fiscal year, we are affirming our fiscal full-year guidance. Looking forward now, the nation’s healthcare system has evolved into one of the biggest social and economic issues of our time. And we believe that Premier, in partnership with our members, is uniquely positioned to lead the transformation to lower cost, higher quality, population-focused healthcare delivery. Healthcare providers today are under tremendous pressure to deliver value and contain costs. Washington is moving aggressively to implement the payment and delivery reforms of the Affordable Care Act. And fee-for-value is fast becoming a reality for both health system operators and for physicians and other healthcare professionals. As a result, the need for health system and physician alignment has become critical to success in this environment. Yet the ability to measure quality improvement and physician performance and to design appropriate provider incentive systems across the healthcare continuum has been difficult to achieve. For some time now, our member health systems have been developing physician enterprise strategies to align their employed and affiliated physicians in anticipation of this shift to value-based payment models. At the same time, Premier’s been addressing our members’ physician enterprise needs through organic development of a suite of comprehensive applications, which will now be significantly enhanced as a result of the acquisitions of CECity and InflowHealth. CECity’s scaled ambulatory footprint is essentially a mirror image of Premier’s acute inpatient and outpatient quality improvement and reporting capabilities, while InflowHealth brings additional expertise and analytics around physician benchmarking and productivity. Together, we believe we are truly creating a unique set of offerings that allow our members to build networks and measure their overall clinical performance across the continuum of care. These capabilities clearly differentiate Premier in the market. When you think about it, the ability to measure value is fast becoming the common denominator in healthcare delivery. And we believe Premier is very well positioned to do this. We collect and analyze vast amounts of data from disparate sources and arrive at actionable insights that drive fact-based decisions. These decisions help reduce supply chain costs from pharmaceuticals to medical devices. They improve quality and safety in the delivery of care. And they provide predictive analytics for effective Population Health management. So we’re excited about the opportunities ahead in fiscal 2016 and beyond. We move forward as a provider-led healthcare solutions Company that has achieved significant scale by building strong relationships with members and suppliers over our 20-year history. Our organization is built on a foundation of member alignment, commitment and co-innovation. We believe this model and its multiple revenue drivers position Premier to produce strong financial results, demonstrated by our first quarter performance and our long-term growth." In continuing fallout from a recent conflict-of-interest scandal, National Quality Forum President and CEO Dr. Christine Cassel is stepping down from two outside board of directors jobs amid questions about whether they created conflicts of interest for her. Cassel, 68, has served on the board of directors at Kaiser Permanente Health Plan and Hospitals since 2003, and has held board positions with healthcare supplier and consultant Premier and its predecessors since 2008. She told the National Quality Forum board of directors last Wednesday that she is resigning from both roles because they had become a 'distraction' for the NQF. The changes come as the NQF works to contain a conflict-of-interest scandal on one of its committees." Dr. Christine K. Cassel and the ABMS's felonious scams. When will justice be served? There is no more powerful indictment of the ABIM and ABMS in collusion and conspiracy to defraud physicians and the public than Wes Fisher's blog post and the investigative article "Maintenance Of Certification, Medicines House of Cards." Every physician and patient should read this and ask for the IG, DOJ and the IRS to investigate the ABIM, ABMS, NQF with an emphasis on Christine Cassel and her cronies - no matter at what level of government or corporate power her cronies occupy. There cannot be one set of laws for elites and another set of laws for the common man and woman. Christine Cassel should have been investigated, indicted, and fairly tried. We can't survive as a society of moral men and women when we have a double standard with a free pass given for the rich and powerful who hold sway over us. The money changers have fled from their high seats in the temple of our civilization. We may now restore that temple to the ancient truths. The measure of the restoration lies in the extent to which we apply social values more noble than mere monetary profit." Is NJ federal judge Katharine Sweeney Hayden, as a political ally and friend of Christine Cassel, Hillary and Bill Clinton, a conflict-free judge? Should she disclose her political, social and familial relationship and recuse herself? One very important question: how did it happen that a "single count copyright case" got assigned to a retired judge of judge Hayden's stature and prominence? She takes very few cases. What was so significant about this one? To any knowledgeable observer the bench is stacked in favor of ABIM and Christine Cassel et al. For those who don't know Christine Cassel, a counterclaim defendant in the case was appointed in 1997 to the administration of Bill and Hillary Clinton--the same year judge Hayden was appointed to the New Jersey federal courts by Bill Clinton. Christine Cassel has worked with Hillary and Bill Clinton on healthcare reform since 1992 and is in close contact with them and the ABIM. Hillary Clinton and the ex-president Bill Clinton have remained extremely active politically and in promoting healthcare reform. Also judge Katharine Hayden's husband was elected as a pledged DNC delegate to Hillary Clinton in 2008 and 2016. Please tell us why is so much privilege being granted in request for ABIM documents by Salas Rushford. And why is a critical deposition not yet made a public court document? I am referring to the deposition of Benjamin Mannes, which has bearing on more than just this case; it may point to the Obama/Clinton/Cassel White House abusing power to influence a federal judge to award a rare ex-parte writ for ABIM staff to seize property and files of physicians improperly. This sealed writ allowed for the ABIM to go on a fishing expedition against thousands of unnamed physicians in violation of their constitutional rights. Should not this be obvious to any judge who studies the merits and demerits and history of this present time-barred case? And why was this case not allowed to take place in Puerto Rico where Ballard Spahr has offices. The whole fishing expedition smells fishy and should be looked into by impartial independent investigators under the jurisdiction of a special prosecutor. "ABIM v. Salas Rushford v. ABIM, Christine Cassel, et al"
This case started out as a politically and financially motivated copyright lawsuit to intimidate ALL physicians. Dr. SR is a pawn in their continued abuse. But, now it is obvious ABIM's "powerful" attorneys are engaged in trying to cover up for their own deceitful practicies and ABIM's past wrongdoing. Ballard Spahr attorneys and ABMS executives and their corporate/political allies were perhaps not fully aware of the dangers involved in opening up their past liabilities to new scrutiny with new facts emerging. I am speaking of the ABIM's fishing expedition against physicians in 2009 in ABIM versus "Arora Board Review". Would ABIM and Ballard Spahr have risked it if they did not believe they had a judge in their pocket? Now that the judge is exposed as an ABIM/Clinton/Cassel insider, I wonder how secure they feel now as they keep getting corporate privileges granted on the advice of Judge Hayden. The next court actions will be physician initiated lawsuits now that docs are more aware of the conflicts of interest and corruption at the ABMS. When the new presidential administration commences and new attorney general is sworn in to "clean up the swamp", I would expect to see class action lawsuits against all the ABMS member boards for participating in these political/financial scams. MOC is history if physicians push back. It is up to us. They have shown no mercy and neither should we. Anyone who has been harmed has a case. The ABMS will soon find it hard to keep an insurance policy. ABIM/ABMS executives compensation, perks, deferred payments and retirement. What is it all about beside the big payday? From Baron to Cassel all the way back to Thomas Brem? Straw payments to front-men and front-women in exchange for political activities including pushing for legislation of partisan healthcare reforms? Lobbying and expert testimony to Congress and the White House? Undisclosed political campaigning and influence pedaling behind the scenes? What is the ABIM/ABMS? A testing company with a felon administering over its clients? Or is the ABIM/ABMS a hospital/ambulatory "quality forum" making recommendations for Wall Street in lieu of the CMS? Or is the ABIM/ABMS a hedge fund raking in five billion dollars over the past 10 years and growing, thus consolidating its political and financial empire? Is the ABIM/ABMS a real estate investment cartel purchasing condos in Philadelphia, properties for lease in adjacent business parks, and creating for profit spin-offs with offices in Atlanta, GA.
Why does a US testing company which cannot produce reliable testing domestically need to expand its brand and trademark by spending physician fees on international divisions with offices and subsidiaries around the globe? Why does the ABIM/ABMS need to spend money on establishing foreign governmental and educational relationships? Why do the executives of the ABIM/ABMS need to take luxury vacations in Venice, London, Singapore, Okinawa, Dublin, and oil rich capitals of the Middle East in pursuit of this? Does the ABIM/ABMS have slush funds that are unknown to candidates and diplomates?Undisclosed money flows unsuspected by the IRS and government regulators who should understand what corruption runs amok in American quality assurance networks and what is at stake to the public who relies on accurate 990 tax filings to check for possible fraud? Who is funding these highly lucrative illegal political agendas with the continuous obfuscated finances and political follies? Informed opinion: Whether its about Big Tobacco (Thomas Brem of the ABIM/ABMS/VA) or Thornton's recent Asbestos political nightmare -- the straw man donation scandal -- the results are the same. The ABIM and their political cronies are after one thing only. Big MONEY in their pockets. They are in the pockets of special interests and their political allies. That's the quality assurance racket in a nutshell today. Corruption and scandal. Physicians locked in a pay-to-play scam. Ballard Spahr's 2016 campaign contributions - $271,000 - mostly to Democrat Party. ABIM's law firm contributed nearly $101,000 to the Hillary Clinton for president campaign. And over $21,000 to former Bill Clinton advisor Kathy McGinty for US Senate Dem., in Pennsylvania. Hillary Clinton's campaign was crippled by federal investigations into potential wrongdoing as Secretary of State regarding mishandling of state secrets. Allegations of pay-to-play while secretary of state caused also caused many voters to vote for third-party and aided in electing the Republican nominee. Philly Inquirer endorsed Dem Kathy McGinty for US Senate. McGinty was a former Bill Clinton environmental advisor and PA state environmental secretary awarding contracts to her husband's companies he represented as a lobbyist. Incumbent junior Senator Toomey won the election. Toomey vowed to repeal the unpopular Accountable Care Act of the Obama/Clinton White House.